Why is Nuclear Energy Necessary in Japan? 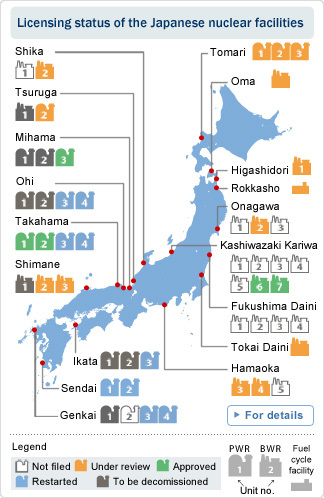 Japan has developed the research of nuclear power generation since the middle of the 1950s. A test power reactor, JPDR, started operation in 1963 and Tokai Power Station, the first commercial reactor went into commercial operation in 1966 with a generation capacity of 166 MW. Before the Fukushima Daiichi Nuclear Power Station Accident brought by the Great East Japan Earthquake on March 2011, 54 commercial nuclear reactors were in operation with a total generation capacity of 48,847 MW and about 30% of electricity comes from nuclear power. But after the accident, nuclear reactors were gradually shutdown, and on May 2012, all reactors were shutdown. In July 2013, the new regulatory requirements set forth by the Nuclear Regulation Authority (NRA) were put into effect. Current licensing status of the Japanese nuclear facilities is as below.